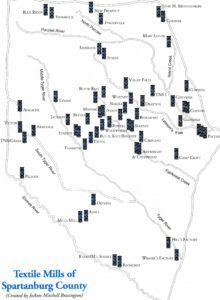 From a rude beginning in 1816 near Cross Keys on the Tyger River, the textile industry in Spartanburg County grew by fits and starts over the past two centuries. The early mills up until the late 1800s were built on the rivers and larger streams. As steam replaced water power, mills moved away from the river banks and could actually be located in towns high and dry away from possible floods. 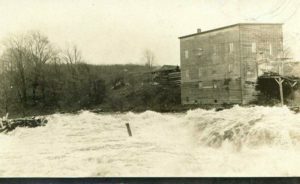 A huge “freshet” or flood in 1903 swept away the mill at Pacolet. The map to the right shows the approximate location of the old and newer mills in the county. Textile Town, a project of the Hub City Writers Group is “One part historical narrative, one part scrapbook, one part encyclopedia, and one part oral history” a quote from the Introduction. A distinguished group of historians and writers was assembled and each tells a story. A fascinating read with 250 historic photographs placed throughout 350 large 9 x 12 inch pages – all for only $20.00. 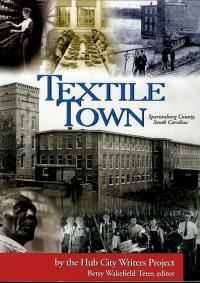 http://www.hubcity.org/history/textile-town.html Accessed April 2, 2008. 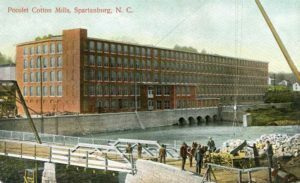 Peter Metzke, Melbourne, Australia has created a very nice story about the Tucapau Mills, Startex, Spartanburg County. 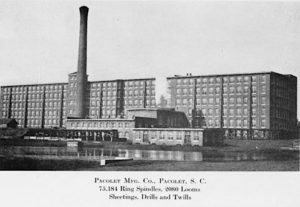 This undated and untitled post card has “Pacolet Mill No. 2” written in pencil on the reverse side. This appears to be an early grist mill and not a textile mill. If you can help, please let me know. Perhaps this photo was taken during the flood of 1903?